The golden penny? What is that then? There were a few occasions I saw the golden penny on the floor and I chose to walk on by. When the moment of reality hits home a clear reason that tempts you to get started to change, it is more at that moment a desire to change ones life, not so much I want to lose weight! It is an overwhelming feeling of a need to feel well, a need to not live in the dark any longer. During my journey I have had beautiful friends that had fought to live whilst fighting cancer, these ladies inspired me beyond measure, but my own self critic hated me, loathed me, I was weak, I was nothing in comparision to my amazing friends. This could have been a moment I could looked to those ladies and used the inspiration I saw in them to lift my own journey. This did not happen that inner critic took me deeper into depression, yes I attempted change but my emotional eating was so engrained I could not believe in myself to overcome the situation I was in. The light dimmed on those golden pennies, I heard the drop but I did not pick them up. In July 2011 I attempted to cover a music festival in Stevenage, Sonnisphere, it was a huge struggle, day one meant I just covered one stage which meant a short walk from the press arena, some times it was hard to even hold my camera, my hand would shake as it was heavy with the long lens on it. But the photography side of my life is another post to talk about later. At this festival on the second day I arrived and walking back stage to the press arena, I felt really unwell, so odd, I felt sick, dizzy, not the heart holding heart attack we often envisage, I did not have in particular severe pain, but I just knew I had to stop walking, I knew something was really wrong. The upshot was I was taken to hospital, a blood test revealed I had had a heart attack, they carried out an angioplasty the following day, whilst in theatre, they discovered I had a severe blockage of LAD artery some 90 odd percent quite dangerous! They carried out a stent procedure there and then. After a few days in hospital I vowed to get healthy and was thankful for the team treating me. This mindset did not last long as depression moved in a few weeks later. The dreaded D word seems to play a huge roll in my developing life. So a golden opportunity to turn my life around was once again left on the roadside and that golden penny was lost. When my father in law was terminally ill with cancer we visited him and I can remember walking to his room and it really hurt, I was in so much physical distress, but I had to do this. Sadly my father in law passed away such a sudden and fast moving cancer none of us had time to take it all in. The day of his funeral well perhaps that was his parting gift to me, the final golden penny I would eventually pick up! I can remember walking well hobbling to the crematorium from the car, I was struggling to stand at this point I was well over 30stone approx 32 stone. Walking into the crematorium for his service I was the almost the last one through the door, I can remember feeling embarrassed, scared, upset for this day of my father in laws funeral, the pain on my husbands face as we saw his coffin stand before us all. The service seemed to go on for ever, it was as though time stood still, I stood somehow to try and sing and robotically do what people do at such affairs. Then my husband, children and myself took our turn to go to his coffin and lay roses on it, as we stood there, I felt this tremendous moment of clarity, the final golden penny, I saw it and picked it up, this was the moment I knew I could change and wanted to change. I did not want to die of my own hand prematurely from over eating, I could do this, it was a few weeks later that I walked into my Doctors begging for help…. 9 th August 2014 was a Saturday, I woke up early, often did not sleep due to so much pain in body from laying down. I had been trying to lose weight for a few weeks now and not really feeling like I had lost all that much weight, but I was getting my trigger foods in control and was starting to feel a little more positive. I had resounded myself that I was going to have to continue to prove I could lose weight in order to have the bariatric op I had applied for. On this Saturday morning I woke up with a clear mindset, right I am really going to go for this – no more fear, yet I was afraid, but squished that thought out of my head. I said to my husband Darren I am going to see which WW class is open and going to it! Such was my determination to see this through – I had done WW before and new it could work, well any plan can work, we just have to drive them! But I knew what to expect with WW and felt less fearful. My husband drove me and as usual was so hard to get in the car, he would lift my legs into the foot well, the pain was terrible in my hips, I am very bottom heavy shape and much of my weight was on the lower half and legs. We drove to Haydon Wick in Swindon where the class was being held in a small church hall. I hauled myself out of the car, and took a few steps was no far only maybe 10 steps, I had to steady myself and regain composure before walking through the door, stop myself panting. I walked in a bit scared to look up, I did notice one lady look up at me, was later to realise what a beautiful soul she is. The room was buzzing as there was a class just finishing, I found a seat to sit on, took off my jacket and just sat until it was time for the class to start. My usual WW leader was not there that day, I am afraid I can not remember the stand in leaders name. She was kind I could feel myself panicking to stand on the scales, not so much the number but the pain, when your legs are so very big brining them together and keeping them in that position for more than a few seconds is so difficult, and as the base of the scales is not the large, I had to hold my legs together to stand to get weighed. I can remember a few people saying hello, but if I am honest it was all a blur at the time. I can remember the stand in leader explaining the Simple Start to me and I loved the sound of this formula, just what I needed, I had been eating pretty simple foods with the help from the bariatric support group nutritionists so the two fitted well together. 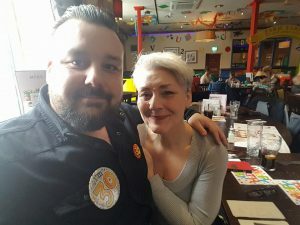 My husband had waited outside patiently for me, I was so relieved to have joined and something new to focus on, an extra support group to help me lose the weight so I could have that operation and save my life! There are so many finer things to tell you – I hardly know where to begin to form the picture of how I felt and what it meant to me. After so many attempts to lose weight I had a plan this time it was going to be the last time! The operation was a back up and I was helping myself in the meant time. There was genuine hope within my heart – that started with having self worth enough to consider I am worth the effort to change, everything I had done in my past until now had not worked and that thought was strong in my head, so with that in mind I took upon this as a chance to go about things in a very different way – the penny had finally dropped! What exactly is living in the now? For me living in the moment, the now is a healing process I have used to move on from the past. Our past have helped shaped who and what we are now, but we can change and shift that, our past mistakes do not have to define or today, this is what I realised and decided to do almost 4 years ago. Where did I start? Self forgiveness. Now this sounds so blase but I promise you by letting go of self hate, regret and looking backwards at all my failings, all I did was perpetuate those things in my life, a living cycle of setting myself up to fail. Self harm with eating food may sound odd, but it is what I did. I can remember standing once in front of my husband shouting and crying and stuffing food aggressively into my mouth and eating it in front of him in anger. I have had some serious issues with emotions and food control which ended in self harm. I had felt so much guilt and shame, I had lost beautiful friends to cancer who had fought hard to live, who deserved to live and yet I was throwing my life away, rather than feel inspired by their fight, I hated myself all the more and punished myself more and accepted the worth, the bar I had set was so low. It was the death of my father in law David in 2014, at his funeral which was pretty traumatic just getting out the car and into the chapel, standing to sing, standing by the coffin, in front of all those people was acute pain in emotion and physical body. Holding onto anger and regret is such a vicious emotion that robs us of hope and a better today. The inner self critic is harsh, learning to silence that voice has taken practice and every now and then it speaks, the way I have learned to silence that voice is by deliberately thinking of something I love, distraction, break the cycle. Losing the amount of weight I have lost did mean control with eating plans as guidance, but before those things could be effective I had to come to terms with the past me had gone, only the woman I am today remains, what shall I do with her? The dream of who I want her to be? Shifting my focus into hope was the first step to enabling change. With this sense of hope and self worth, a right to enjoy a happier life because I deserved it meant I was able to take control with baby steps my bad relationship with food. Love yourself, respect your worth and treat yourself like you would treat others. My favourite quote as many of my friends know is from The Wizard of Oz, Glinda Goodwitch “you always had the power my dear, you just had to learn it for yourself”. Be strong you do have the power, please do not tell yourself you are not as strong as others, because if you think that you will become that. One day some 4 years ago this May, I was at rock bottom around 32 stone and was desperately unhappy, I went to my Drs to ask for help, in fact I can remember breaking down and begging him to find some how to lock me away and get someone else to manage my food, then after a few months I would emerge a new woman. In fact that is not a realistic thought, I was so depressed so so low, we talked for some time, he was very kind, I asked if I could be referred for bariatric operation, which he said he would, he said I would need to show I would need to prove I could lose a little weight my self. He prescribed ani depressants for me, I wiped my tears and thanked him endlessly. I went home that day feeling a little hopeful as now I had a plan. I had always said I would never have a bariatric operation, but I never thought I would be so low as I was. Weight loss began in a very simple way, cutting out things a little at a time, crisps, alcohol, take aways were the first to go, one by one I took out my trigger foods. Slowly I was regaining some self faith, I did not focus on being hungry, I ate when I felt hungry but ate regular foods, basic foods and not processed foods. Some weeks, many weeks went by and I was only weighing myself monthly and although I did not feel any different in size, I was losing weight just by cutting back. There was no word from the bariatric referral and I just kept faith the back up would soon be with me. One morning in August I woke up and decided I just can not wait any longer to hear from the hospital, I got my ipad out and looked for whichever Weight Watchers class was running in my area. I found one in W Swindon close to where I lived, I just had this feeling, secure feeling it was the right thing to do, a gut instinct that my future was calling. Next blog post I will tell you about the first time I walked through the door of the Weight Watchers meeting and what eventually happened with the bariatric journey. Reflection can be a heart warming experience yet also it can be heart wrenching. How we learn to move on from the negative experiences of our past and hold close the positive memories is key to living a happier life. Some sad things in our past can mark us greatly as an adult but they must not define us, that has taken me a very long time to come to terms with. So today I have reflected on how on earth I ever got to 34 stone, I have had that question asked of me a few times, I honestly do not know how I did. Well I know the facts are I ate too much and moved too little! But the but is huge, how emotionally I let myself get to 34 stone is a much bigger question. Looking back over my life I have comfort ate and eaten in secret many times, a plaster to make myself feel better for the moment. As a child I felt loved, very much loved by my parents. However I grew up in quite a violent home due to my Dad’s drinking and violence towards my mother. As a child I witnessed many things that a child should not have, my poor mother suffered badly at his hands, when my Dad was sober he was a lovely, but alcohol turned him into a violent wife beater. The graphic detail of this childhood really is too much to bare and I am not sure it would be right to bring it all back into present life as thats not fair on my Mother. So you are getting a picture of me from a very young age around 5 when I witnessed and still remember terrible violent beating my Mother had, I can remember fleeing the scene screaming. So my comfort eating began quite young. As an only child I expect I shouldered much emotional baggage, but amongst all of this chaos was love, my Mother a strong and amazing women did everything in her power to give me the best she could, we were not a wealthy family, my Mom had to work full time to put a roof over our head as my Dad often drank his wages away. I had to stay at the grandparents in the school holiday I remember and sick days, my Grandad always spoilt me with my favourite melted cheese on toast, which was always on hand cut door stop size bread. I can remember my Dad dragging me down the path to my grandparents house I would scream I want my Daddy, wriggling and crying I wanted to stay with my Dad. I can remember crying myself to the sleep on the sofa, I think the problem was the house was huge, noisy my Dad was one of 14 children and they had two council houses knocked into one. For me an only child it was all a little overwhelming, so I guess the food my Grandad spoilt me with was again emotional eating. In the 60’s and 70’s people did not interfere with the neighbour who beat his wife, there was no where for my Mom to go and she felt she had not where she could go to find a home for her and her child. Her family would not take her in, the attitude back then was you made your own bed lie in it. How harsh a times and attitude of people back then? Well along the childhood years I was spoilt by my parents and their friends as an only child I had many ‘aunts’ and ‘uncles’ that always bought me sweets etc and gave me pocket money, I was the fat kid who was told it is only puppy fat it will go as you grow older. But that was not the case at all, this makes me smile remembering comments like this. 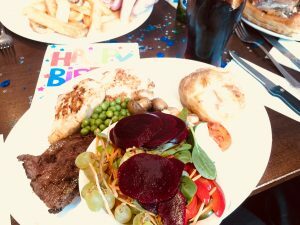 I used to go to social clubs with my parents and their friends, while they played bingo I would be up and down the bar buying crisps and fizzy drinks – I do not remember feeling unhappy about these social evenings, I felt loved by all those people. Love and food seem linked to many relationships, given to feel better, celebrate, commiserate, console, placate, actions that seem to be something that many families do – a treat, but when does a treat become too much? I am still trying to work this one out for myself even at the age of almost 54, now as I am older when I think I have a handle of these things, then a stressful situation arrises and suddenly I am that vulnerable child again seeking treats to feel better and make myself feel warm inside, comfort and hugs from myself within. Even now I have the odd binge of these so called treat foods, chocolate, cake etc, its like I am programmed, in a way perhaps I have been. It is taking living with a mindset of being self aware that has really helped me lose the weight I have to date, but on times that vulnerable child just lets rip and lets me know she is still alive and voices herself to me. Live in the now dear people, do not feel sad for a past that is gone, live for today, make happy moments every day no matter how simple they are. 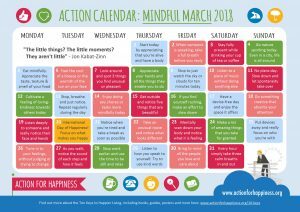 Below is something I found and think is wonderful, something I would like to look into more, Action For Happiness sounds lovely does it not? 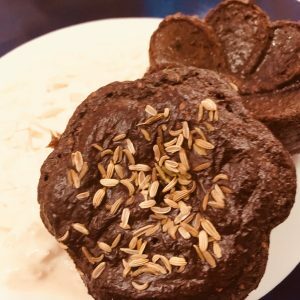 Below my mix grill with salad and jacket potato, when I got home I made my own oat bran mug cake, the cakes at the restaurant looked amazing but glad I chose not to have one. Lastly a photo of my son and I, hard to believe he is 30! Tonight I am going to bed feeling content and happy to be me, until the next time take care…….